A flagship technology from Midway, the Humane-Aire™ System is a controlled atmosphere stunning system (CAS) that reduces stress in handling, transporting and stunning turkeys and chickens. The Humane-Aire System is helping set a higher standard in working environment and quality of the final processed turkey and chicken. Poultry meat that is processed in the Humane-Aire System, with its Controlled Atmosphere Stunning, typically exhibits less indication of stress, resulting in a higher yield and is therefore a more efficient method of harvesting. 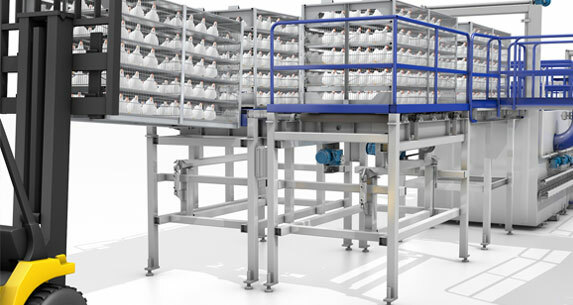 To achieve maximum throughput in a food processing line with many variables, Midway offers an integrated tray filling and sealing system featuring a tray denester, platen conveyor, piston filler and lid sealer. This inline filling system can be customized to meet your specific application. Originally designed for high-speed packaging of viscous products, the piston filler can be modified for various food products and production volumes and the platen conveyor, denester and lid sealer can be changed over for virtually any size frozen food entrée. Midway designs and builds weld cells to meet specific customer requirements for part size, cycle time, and operator interface. Midway Weld Cells are designed to handle high volume production parts in a range of sizes. Robots can be floor mounted or overhead-mounted for optimum utilization of the work envelope and a smaller footprint. Midway is your single source for conveyance as well as process equipment and automation systems. Our engineers can develop a controlled conveyor system to meet your current and future needs – all with accumulation areas, indexing, machine vision sensors and stop gates, and related features to sequence your product through various production stages.